As someone who pulls out her panini maker on a pretty regular basis, I get pretty excited when I stumble across a fun new way to cook with it. Granted, I’ve grilled French toast before, but until yesterday morning I hadn’t ventured to caramelize bananas to stuff inside it and mix up some toasted pecan maple syrup and whip some cinnamon-scented crème fraîche to go on top. I thank chef Bryan Voltaggio (remember from Top Chef Season 6?) and his recipe in the latest Williams-Sonoma catalog for encouraging me to try this restaurant-quality, best French toast I’ve ever had (seriously)! It was one of those weekend mornings when I should have been reaching for a low-involvement breakfast option like a cup of yogurt or an English muffin. My husband was at the gym, both kids were wide awake and in full “play mode” and I was simultaneously in the process of baking some crusty cheddar-stuffed loaves to feature on my other blog. To cap it off, we had a birthday party to go to at noon. It was now 8 o’clock. In short, this was no time to embark on a high-involvement, multi-step recipe I’d never tried before. When I say this was the best French toast I ever had, I truly mean it. Every ingredient is perfect, from the choice of soft day-old challah for the bread, which soaks up the custard mixture like nothing I’ve seen, to the butter-enriched toasted pecan maple syrup that gets even thicker the longer you let it sit. Leave it to a chef to come up with a whipped crème fraîche topping – see, I would have probably gone with regular whipped cream and that would have been a little too sweet. The crème fraîche (I actually substituted sour cream) is just barely sweet, with a touch of cinnamon, and that tanginess is just the right balance for the otherwise rich, sweet dish. You could always cook off this French toast in a regular skillet or griddle, but the advantage of grilling on a panini press is that you don’t have to attempt to flip the custard-saturated challah. 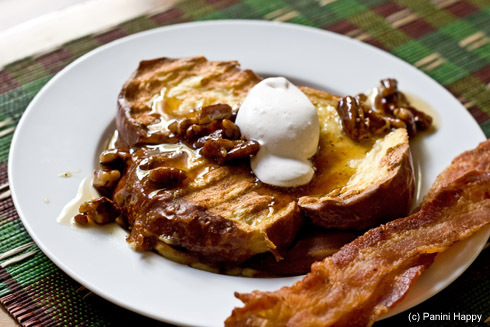 On a morning that’s not otherwise hectic, allow yourself the time to enjoy preparing this French toast – it will be well worth it! To make the whipped crème fraîche, in a bowl, lightly whisk together the cream, crème fraîche, confectioners’ sugar and cinnamon until just combined. Pour the mixture into a cream whipper, add the cartridge according to the manufacturer’s instructions and refrigerate until ready to use. (Alternatively, if you don’t have a cream whipper, you can whip the cream with a hand- or stand mixer until soft peaks form). To make the French toast, in large sauté pan over medium heat, melt the butter. When the foam subsides, add the 2 Tbs. granulated sugar and the water, stirring to dissolve the sugar. Cook until the mixture is lightly caramelized, 4 to 5 minutes. 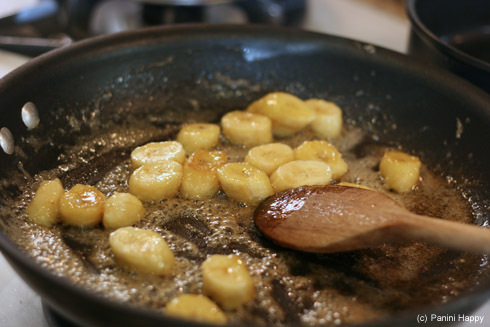 Add the bananas and cook, stirring occasionally, until tender, 1 1/2 to 2 minutes. Transfer to a small bowl and let cool. Using a small, sharp knife, cut a slit 2 inches long in one side of each bread slice, cutting three-fourths of the way. Stuff the pockets with the banana mixture, dividing evenly. In a large bowl, combine the milk, eggs, cinnamon, granulated honey, the 1/2 cup granulated sugar and the vanilla bean seeds and blend with an immersion blender (or just whisk it). Pour into a baking dish. Soak half of the bread slices for 5 minutes, turning occasionally. Place the bread on the panini maker and cook, adjusting the top plate so it lightly presses the bread, until browned, 4 to 5 minutes. Transfer to the rack-lined baking sheet. Soak and cook the remaining bread slices. 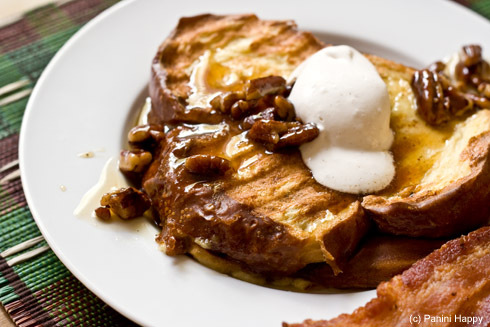 Serve the French toast with the pecan maple syrup and whipped crème fraîche. I wish I was eating this now! This sounds like perfection! I love each and every part of this and am seriously wishing I had a plate of this in front of me right now. I haven’t had french toast in ages! This looks so good! yup! a winner. I like your argument for using the press! no flipping involved! Next post: Panini Happy Turns 3 with a Project & $100 Williams-Sonoma Giveaway!